Level 40. A big jump since I last posted and honestly the quick leveling surprised me. 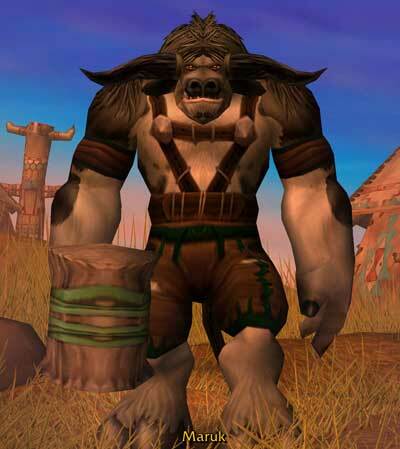 After my Haitus from playing WoW, Maruk was one of the more comforting characters to play. 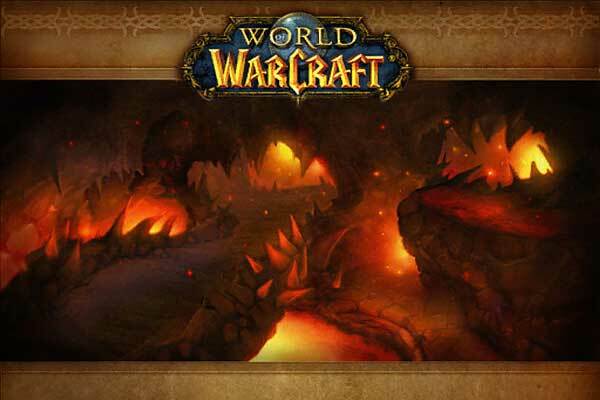 At the lower levels there was no pressure to top dps charts or embarrassment of failing at your class in a raid. 40 was also a landmark as you could train up to Expert 100% speed ground mount riding. Level 54. Its a bit like hitting a wall getting to 54. I remembered it being the same way in Vanilla WoW although thanks to the nerfed xp needed it didn’t last as long. The main problem is how spread out the quests were and how little dungeon variety there was until reaching lvl 60 dungeons. 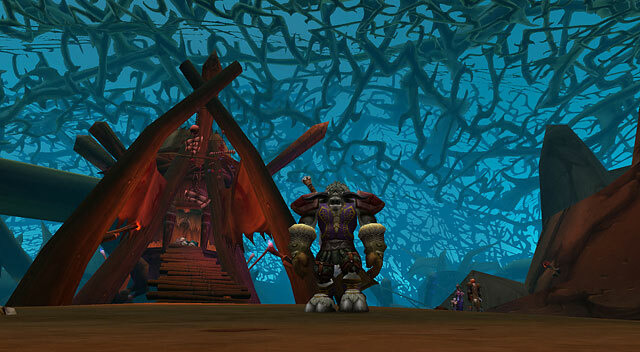 The dungeons get longer and Black Rock Depths feels like the only dungeon popping up for several levels. Level 58. Heading into Outland was another milestone. Flying! Nice how cheap flying has become. It makes all those quest alot easier and its great to mount up and fly to safety if you are surrounded. Gear got a huge bump in dps and stamina. So rather than relying purely on the dungeon finder, which worked great, I did some of the early quests in Hellfire to gain quick upgrades. Level 68. I admit it it was a quick grind to 68, I was looking forward to WOTLK again but from a Horde prespective. I was impressed with Warsong Hold and its impressive visuals. I loved the epic feel of docking in the structure and the forge area with the lava heated walls. Sadly the queue times at the borderline 68-70 range is long with 15 min waits not uncommon so I am doing quests to fill the tme. In a nice change, the quest npcs for the dungeons now appear in the dungeon offering the quest so you don’t have to hunt them down. Unfortunatety you still have to return the quest at the original locations. Another welcome surprise was the reduction in price of dual specs to 100g from 1000g. It means that you can more easily experiment with other specs or if you are a tank of healer learn a good dps spec for leveling and yet keep the other spec for dungeons. Sepaking about costs. The cost of cold weather flying was halved as well to 500g and you can now purchase it directly at 68 rather than requiring a higher lvl 80 alt to purchase it for you. Unfortunately Artisan flying (280%) is still 4k and out of my reach. I had a sudden thought as I logged out on Maruk last night, what about glyphs. Its been some time since I had to re-glyph a character and I had completely forgotten to do so for Maruk. So I made a mental note and the first thing I did today was to log on to Maruk and buy some glyphs. You get your first glyph slots (one major and one minor) at level 15 so I had really dropped the ball going twelve level without glyphs, a major oversight, kind of like not assigning talent points whenever you level. Choices and decisons I made after the break. Things just came to a complete standstill and we sat around waiting for another tank, we pulled solo mobs, fished, and waited some more. Twelve minutes later, a new tank joined the group, we all said “Hi” and…he left. Repeat cycle above. I was after 15 more minutes of waiting above when I decided to just leave. Back to more questing. For the heck of it, I put myself back in LFD. After fifteen minutes, it popped and we had a fresh group for Razorfen Kraul. Nice, a dungeon I had not yet done. It was a good run, no one complained, congratulations went around when people dinged new levels and we moved at a good pace. At the end we decided to go again, and thus started one of the best dungeon chains i had been in for a long time. In all we did four dungeons and I jumped from 23 to 26, not a bad run. In addition I got a nice Tusken Helm and 2-handed axe, Corpsemaker waiting for me at 27. I posted some auctions, upgraded my bags to Netherweave bags and called it a night. So I have been working on the blog over the last few days and added some new items. 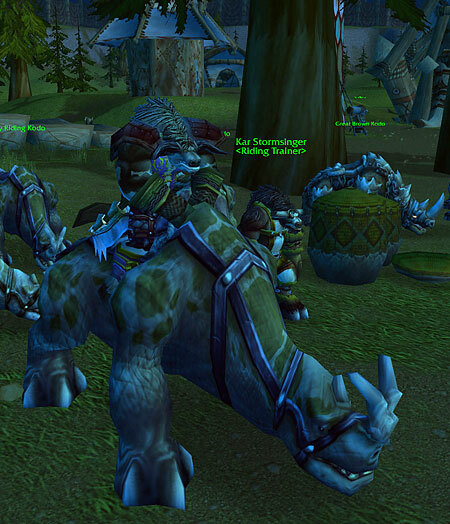 A few new blog entries and revamped and added pages for all my primary characters I play on the Kargath server. With all this updating, I have taken a little break from leveling Maruk and he is still, 21. In the game I have been trying to catch a few more ICC runs but PUGs never seem to get past the first wing, regardless of how geared they are. I was also really disappointed when the new guild I had joined on my main character Nemain was told there was no raiding spot available for a Fury Warrior as I didn’t bring any utility, and only alts that heal or tank get to go on the second raid nights. I don’t think they understand that my Shadow Priest is really my alt and in fact the last one to hit 80. It just seems hard to raid as a melee. Just stay in the back with the animals and other disposable pets I guess. 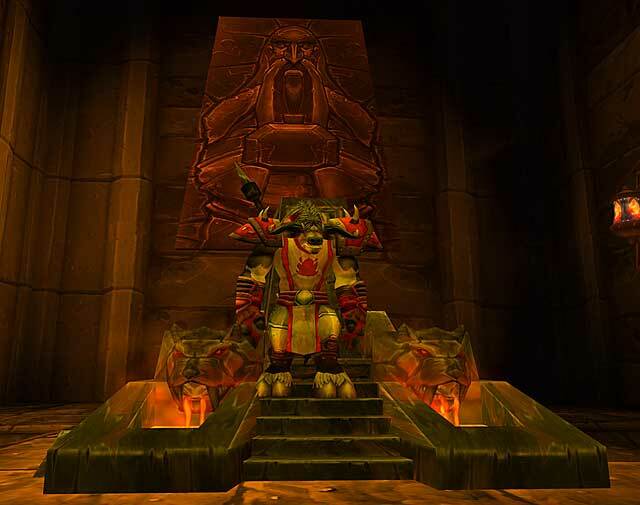 Considering leaving the guild on my warrior and trying to find another guild that wants to do progression and has a regular raid spot for a Fury Warrior. No easy feat this late in an expansion. I have added links to the wow armory for my alts and am in the process of adding pictures. More to come soon. Just like getting a driving license in real life, turning 20 in WoW and getting a mount is one of the greatest things in the world. Suddenly the world opens up and everything seems closer than before. So after the experiences in the last post, I took a good hard look at how I was going to level Maruk. While my initial plan was to put points in both Arms, taking Improved Heroic Strike and Shield Specialization, so i could tank instances, I realized that without the support of par level gear supplied by a main it would be tough going. I got to play with my new warrior a little more today and lvled him a few lvls to 15. Fifteen is a big step as you can now use the Looking for Dungeon tool to pug random dungeons. Never having used this tool at such a low level I was interested to see how the experience was like. Ouch in short I really shouldn’t have used it. Details after the break. Of my 10 regular classes I play, the last one to hit 80, my priest Candrix, did so early this year and it was quick leveling her from 70-80 especially with the help of heirloom items and cold weather flying from the minute she stepped into Northrend. So feeling out of touch with the leveling experience and with no slots left on my primary server, I decided to try leveling a brand new character without any help from a “Main” character. That meant no money, and no equipment. To Make the experience even fresher, I decided to do it playing Horde. A big change as all my characters are Alliance and I have never got a Horde character past level 10. 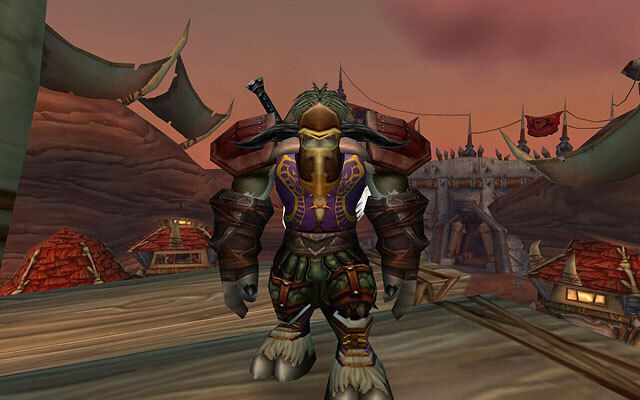 Thus Maruk, tauren warrior of Kaz’goroth, was born. How far am I going to take it? I have no idea, at the moment it’s a character I play when I need a break from the heroic daily and raiding on my regular toons. I’ll keep you updated as to how it goes.